Regardless of one’s view of involvement on this day, there is a sociological fact that cannot be denied: Halloween is the one day which neighbors are outside of their homes and engaging in something together. There is not another day during the year that we see so many faces and family in our immediate sphere of influence, together. Resources for Reformation Day | Justin Taylor – October 31st is also the day that Martin Luther began his protest movement against the Romans Catholic Church. Great list of resources here. 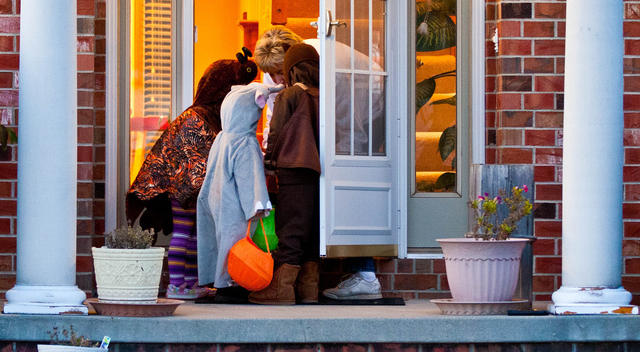 CandyNOMICS Infographic – The average household spends $44 on Candy at Halloween each year. The average American eats 24 pounds of candy. 20 million pounds of candy corn is consumed each halloween. Posted on October 28, 2011, in Bridge Church, Faith In Action, Idea Bank. Bookmark the permalink. Leave a comment.